It seems that things are slowly starting to look good for estranged couple Claudine Barretto and Raymart Santiago as they can now spend time together with their kids Santino and Sabina. This was proven by the posts of the actress on her Instagram account on Saturday evening, one of which has the caption "The Kids, their Dad and I." The post has over 1,000 likes as of this writing and over 100 comments expressing happiness and hope for the couple's reconciliation. 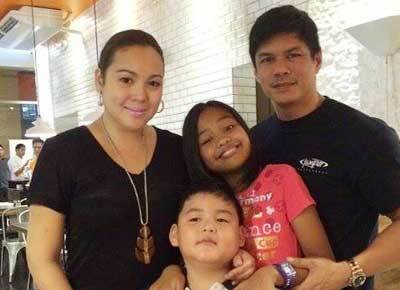 In another post, still with Raymart and her kids, Claudine used the caption "Happy day." Claudine has actually revealed about the plan of having a weekend family activity in a recent ABS-CBN News interview. In the same report, she even expressed optimism over her ongoing legal battle with her former husband saying that, "We may have failed as husband and wife but we will will strive to be good parents for the sake of our children." Last June 20 the former couple faced each other at the Marikina Regional Trial Court in relation to the battle for custody of their kids. The hearing ordered by Judge Geraldine Macaraig required both camps to consider and discuss a possible arrangement regarding their children's custody.